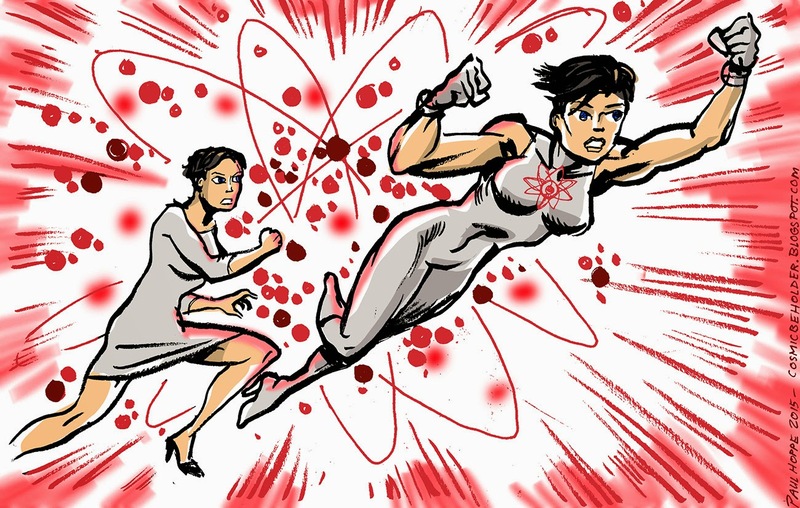 In the reality that is inhabited by Earth-K, Anna Atom has been fighting the good fight since a young age. 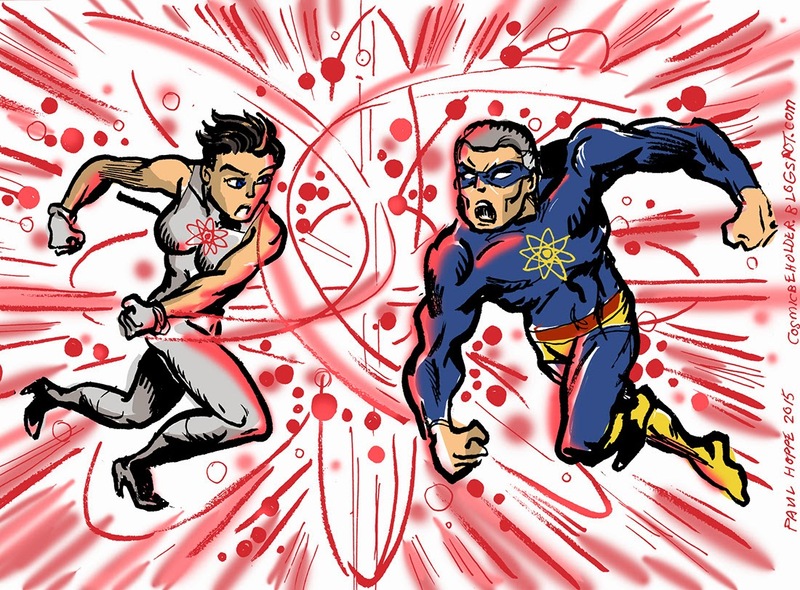 Her differences with her father, legendary super-hero Max Atom, have only increased over the years, as he’s become more of a hard@$$, while she has been advocating a new, more open way how super-heroes should interact with the public. Now it seems the tensions have escalated, and resulted in an all-out, no holds barred super-battle that threatens to level the city. After a a final blow and an enormous explosion of their incredible, nuclear-fueled powers, the dust settles, and… both beings have vanished! Did their incredible might end up destroying the both of them, or have they indeed ripped a hole into the very fabric of the universe, to be thrown into some different, far away dimension? 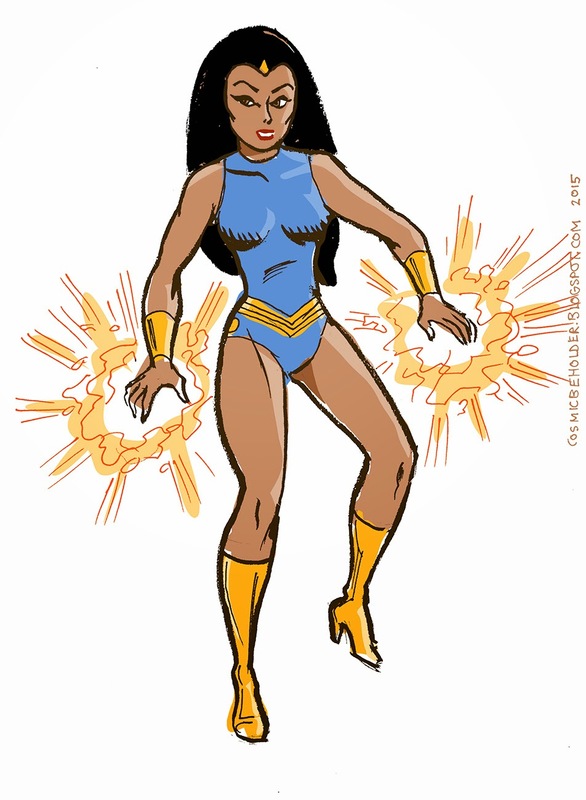 Previous drawings of Anna Atom can be found here and here, and her Public Domain Superheroes Wiki Entry is here. Last time we saw these guys was on page 22. 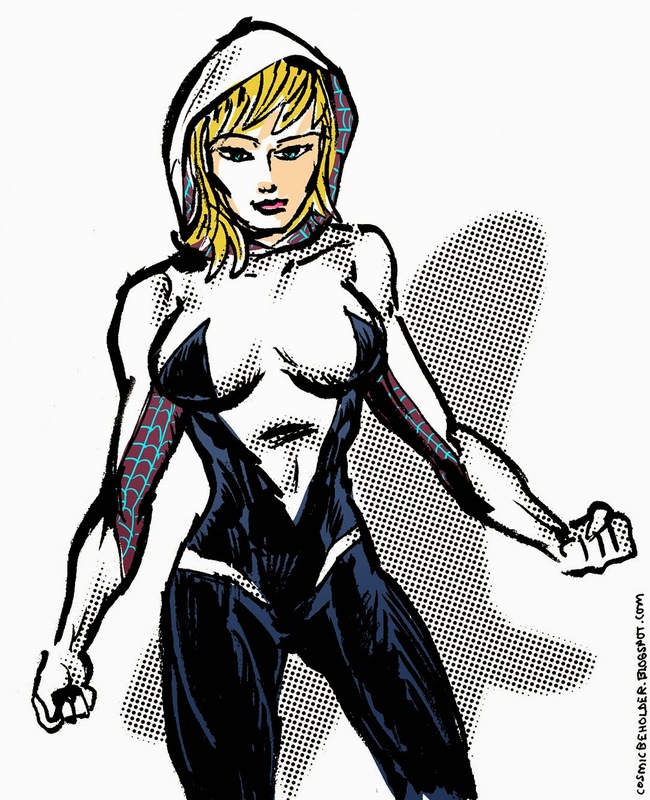 Spider-Gwen was probably THE breakout character from Marvel comics in 2014. Originally just a alternate reality take on the Spider-Man cosmos, she took tumblr and the fans by storm, and has now her ongoing series, the first issue of which became a collector's item. Doesn't happen so much these days anymore! This is my second drawing of her, you can see my first attempt here. Marvel comics' Dr. Karla Sofen aka Moonstone! First encountered her in the Avengers comics, where she took part in the infamous "Siege" of Avengers Mansion. 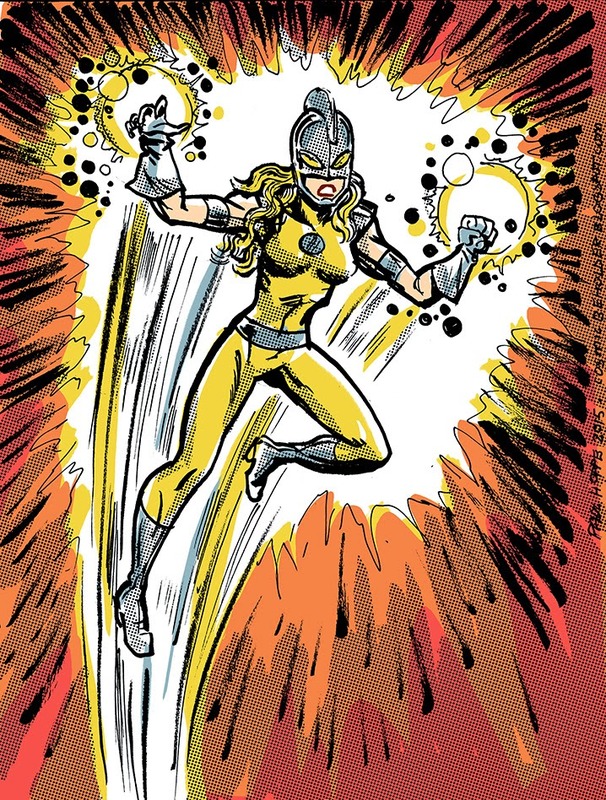 Later, she was a member of the original Thunderbolts, as Meteorite. Yes… but what does it all mean? We'll find out in Tales To Behold 6! 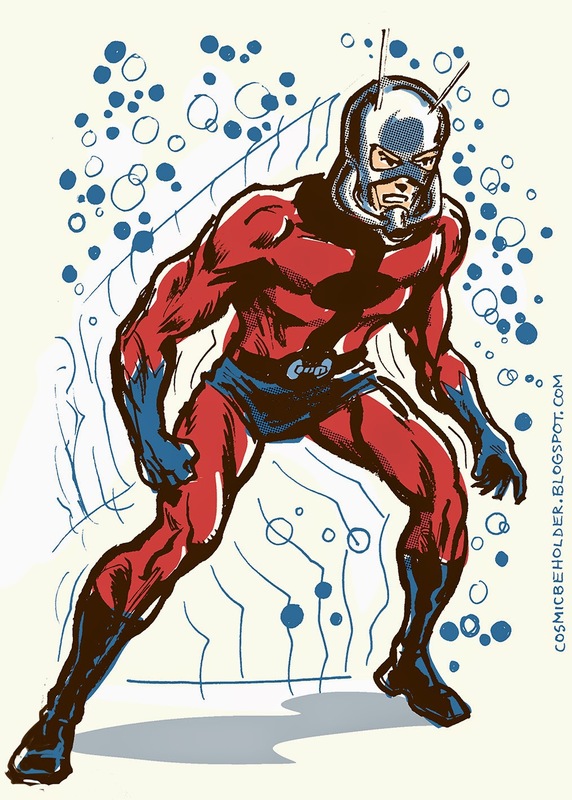 I know Hank Pym is the original guy, but when I first read Marvel, Scott was wearing the costume, while Pym was semi-retired, so I always enjoy Scott popping up, like last year in the FF series by Fraction and Allred. 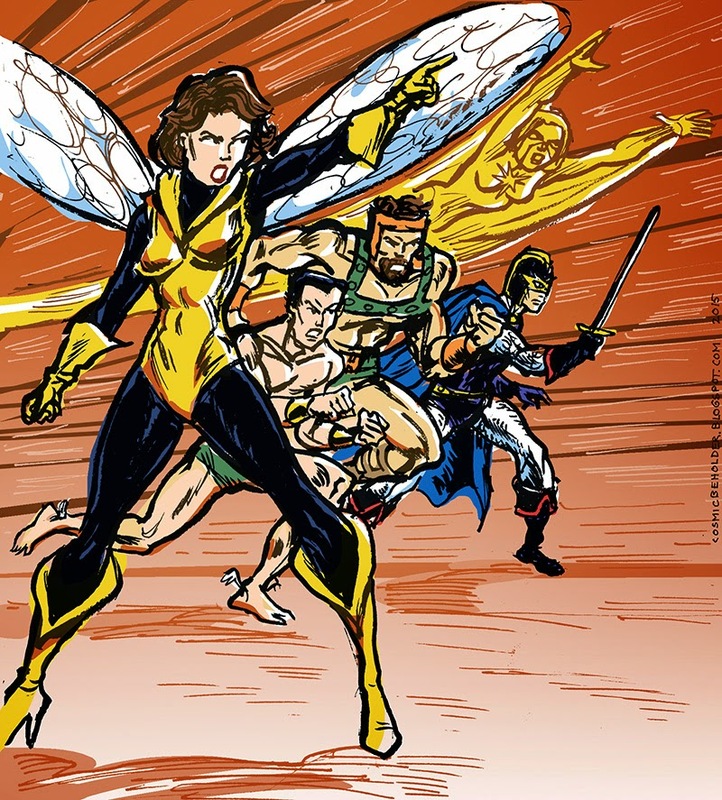 It was legendary when he and the Wasp single-handedly took down Titania and the Absorber in The Avengers #275. A nice roundup about those formative years of his career can be found here. Captain Evening and The Odds will return in Tales To Behold Book 6! 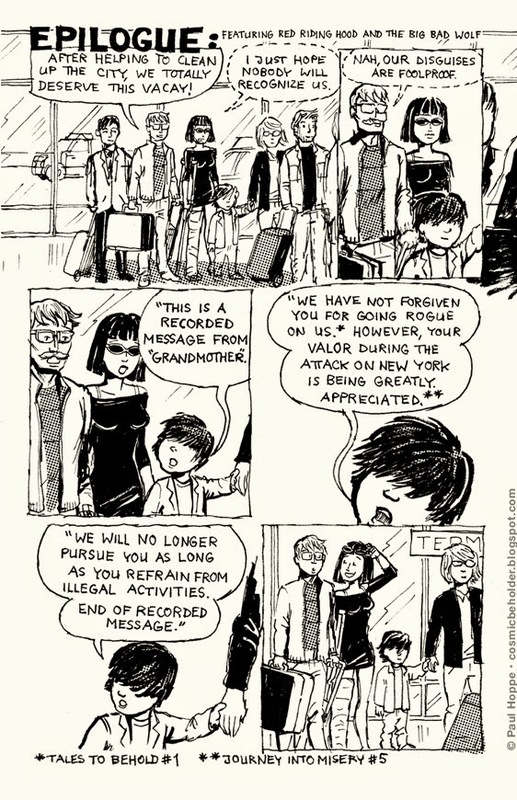 This short comic is taking place after the current Tales To Behold storyline. Centennia reminisces about the events in Symbiote Surprise, a crossover comic drawn by DeviantArtist cyberkitten01 featuring my characters going up against his femme fatale Kate Five. Now Centennia decides to travel to Angel Falls to investigate the current whereabouts of the symbiotic troublemaker. She visits some interesting places that those characters have been to… The entire story leads up to the next crossover with the cyberkittenverse, as you can see by the ending. Really fun to do a shorter story again! I got inspired to do these two extra pieces. The first showcases the tangled web of emotional connections around Centennia right now– she is seeking out Kate Five, her sort-of boyfriend tags along, and she has an interesting run-in with the vampire Marcus. Who will she end up? Possibly none of them?? And finally, a drawing of Centennia based on a design of cyberkitten01 himself. Probably for when she returns to the Bleeding Rose club, after the adventure is over. My second drawing of Anna Atom, a super-heroine from "Earth K", this time showing her in transformation. My previous drawing of her is here. 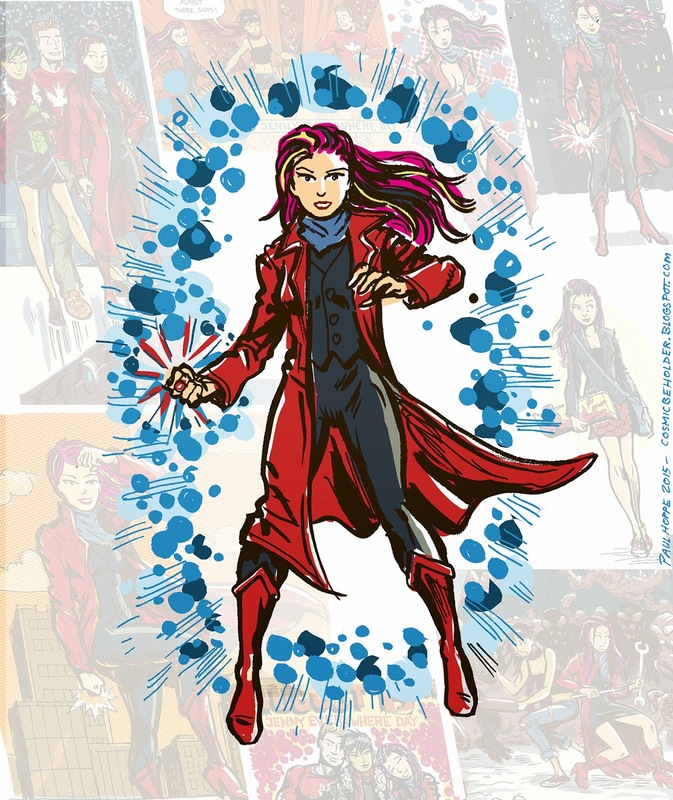 She is the daughter of the super-hero Max Atom and was created like him as an "Open Source Character", free to use by everyone. 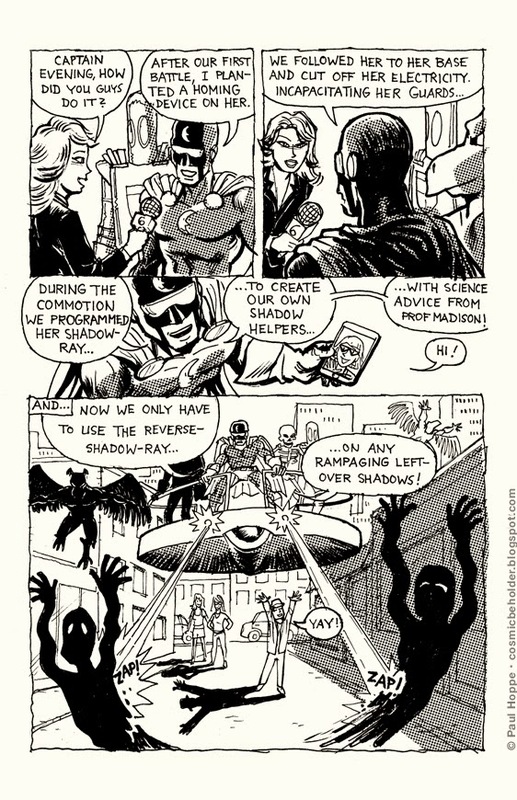 You can read more about here on the Public Domain Superheroes Wiki, or visit the Free Universe forum. Yay! Almost all wrapped up nicely! And there's Amanda Allen again, from the beginning of the story. Remember Ariel, the only sane person in Thundarr the Barbarian? She is so powerful and so much smarter than the guys… what does she even need them for! I like the backgrounds, that depict ruins of modern buildings and civilization in general. 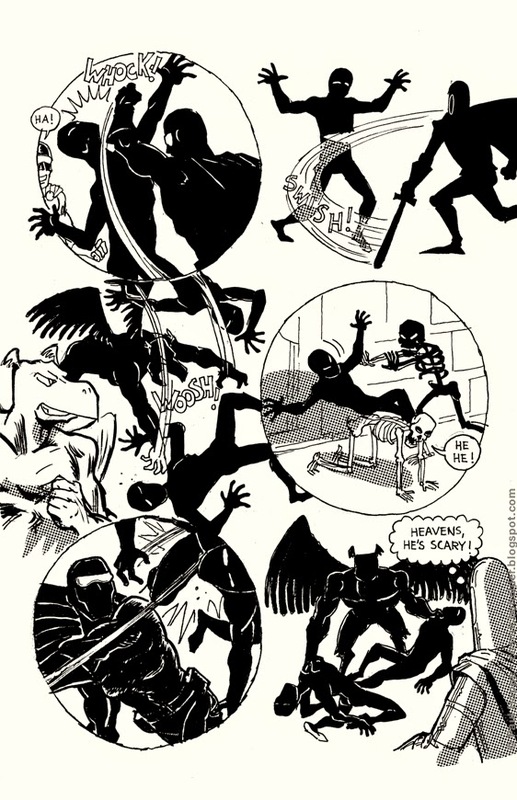 Also, apparently Jack Kirby and Alex Toth had a hand in it. The main villain looks definitely very Kirby-esque! 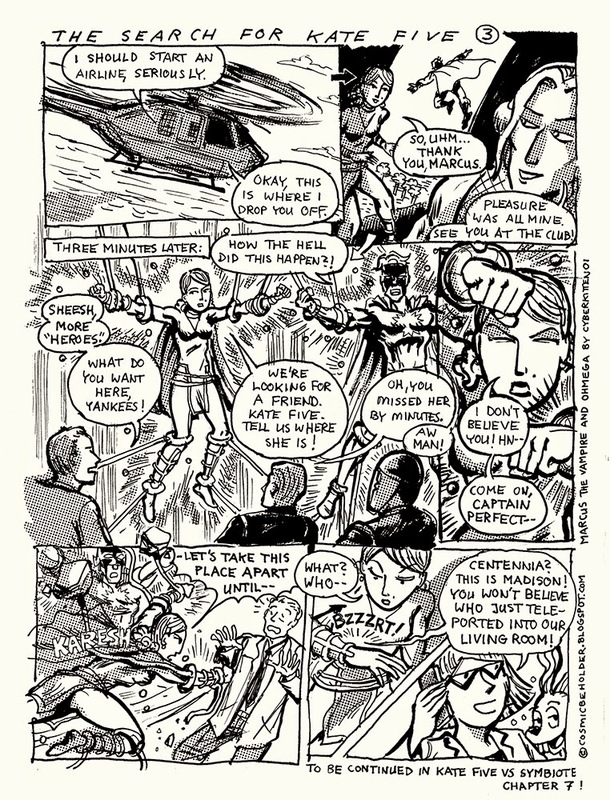 When you ask all-American super-heroine Terry Tornado what the most exciting moment in her life was, she'll tell you there are numerous times in her life that she felt very fortunate. She'll of course mention the Miss Omniverse title, or when Earth was saved from the cosmic solution, or when she helped save reality itself. But, it was winning her very first World Championship Wrestling Federation Championship during her active wrestling days, that will always have a special place in her life: "because of all the support from the fans". What a gal! She appears in Journey Into Misery 3, 4 and 5. Tales To Behold 5, Page 32: Maneuver 16-B! Defeated by shadows! Who would have thunk! 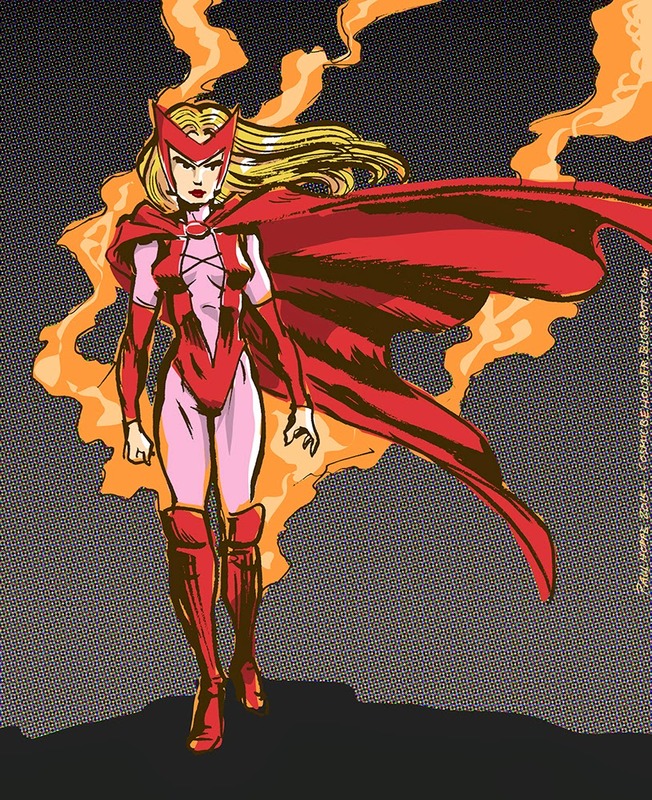 June Covington aka Toxic Doxie, originally created by Kelly Sue DeConnick and Emma Rios, as she appeared in the second incarnation of the Dark Avengers and in the Thunderbolts (Vol1) series, where she filled the role of the Scarlet Witch. She has genetically altered her body to produce certain poisons and chemicals, and is a genius level bio chemist. more recent costume from the Avengers Assemble comic series. Jenny Anywhere is an Open Source Character similar to Jenny Everywhere, an imperfect variation. She can travel from reality to reality, but she’s not as good with directions. She will be part of a future BEHOLDER story. In the background you can see some of the drawings i did of her, along with Jenny Everywhere and Jimmy Wherever. She was originally in b/w when I first encountered her on the PDSH Wiki, so I designed a fun color scheme for her. The characters of Jenny Anywhere, Jenny Everywhere and Jimmy Wherever are available for use by anyone, with only one condition. This paragraph must be included in any publication involving Jenny Anywhere, Jenny Everywhere and Jimmy Wherever, in order that others may use this property as they wish. All rights reversed. 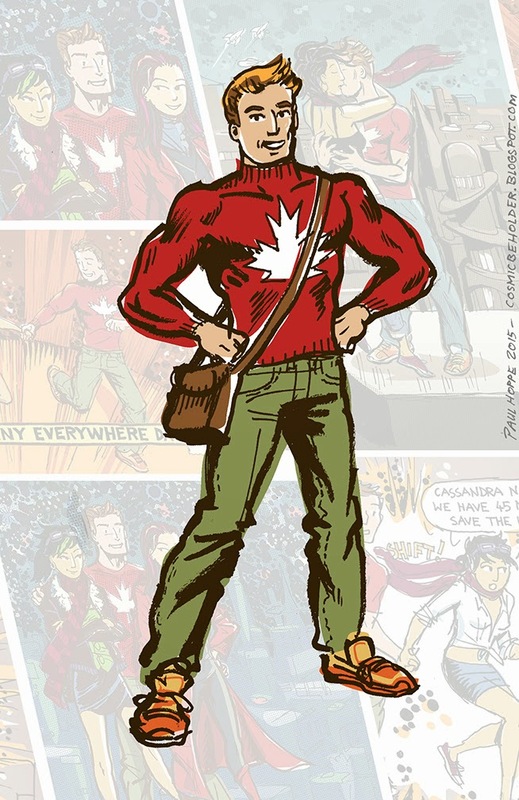 Jimmy Wherever is an Open Source Character, created as a companion to Jenny Everywhere. In the background are the previous pics that i’ve drawn of him, and show him with Jenny Everywhere and Jenny Anywhere. He’ll appear in a future BEHOLDER comic. The characters of Jimmy Wherever, Jenny Everywhere and Jenny Anywhere are available for use by anyone, with only one condition. This paragraph must be included in any publication involving Jimmy Wherever, Jenny Everywhere and Jenny Anywhere, in order that others may use this property as they wish. All rights reversed. This is a character by Deviant Artist cyberkittne01. Valmorri is a Duchess of Hell, and with The Beholder's affinity for bad girls, I had to do a faithful rendition of her. There is also another crossover with his universe in the making, and I'm doing a short comic on DeviantArt to pave the way for it. Previously, he drew a crossover with Captain Evening and The Odds and his character Kate Five, you can read Symbiote Surprise on DA. Tales To Behold 5, Page 31: Follow the Queen! 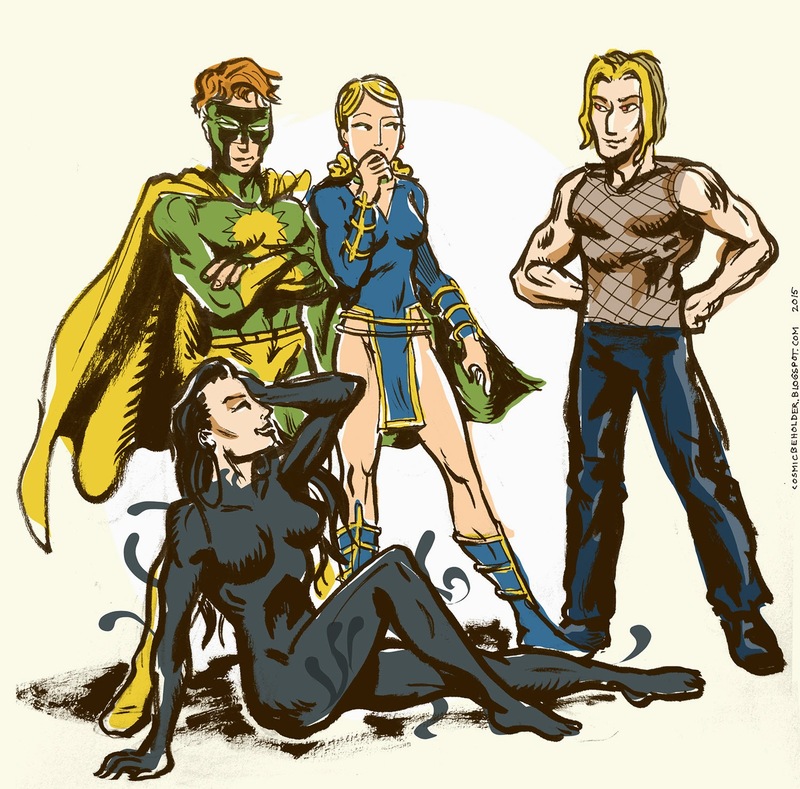 Inspired by the cover of Tales To Behold 6, here are three of the New Protectors, who are turning out to be quite the pain in the neck for Captain Evening and The Odds. These guys actually died in Journey Into Misery 5… or did they? And why are they so rigorous to enforce justice in New York City, going as far as turning it into a totalitarian police state? 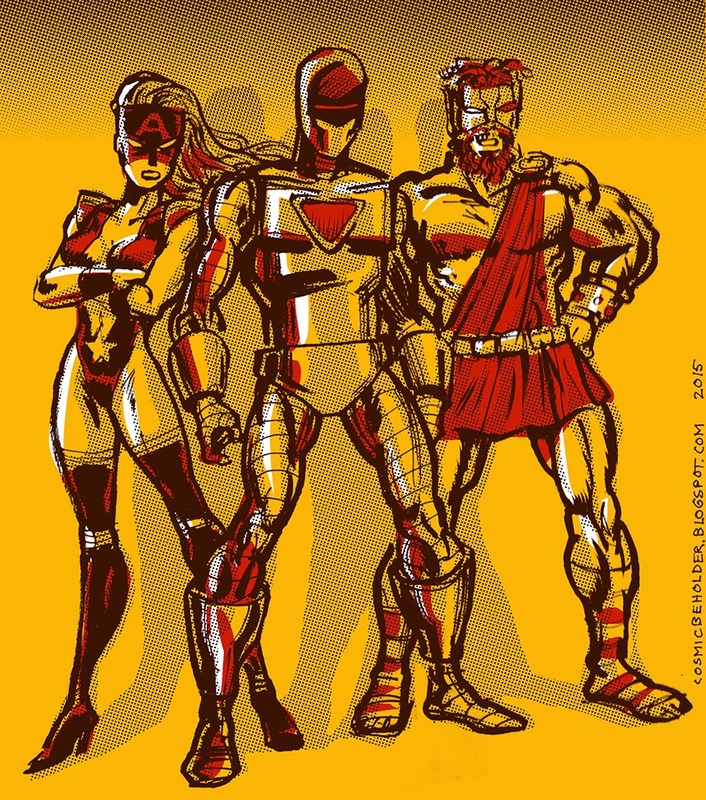 Pictured are Americana, XYZ-2 and Herakles. 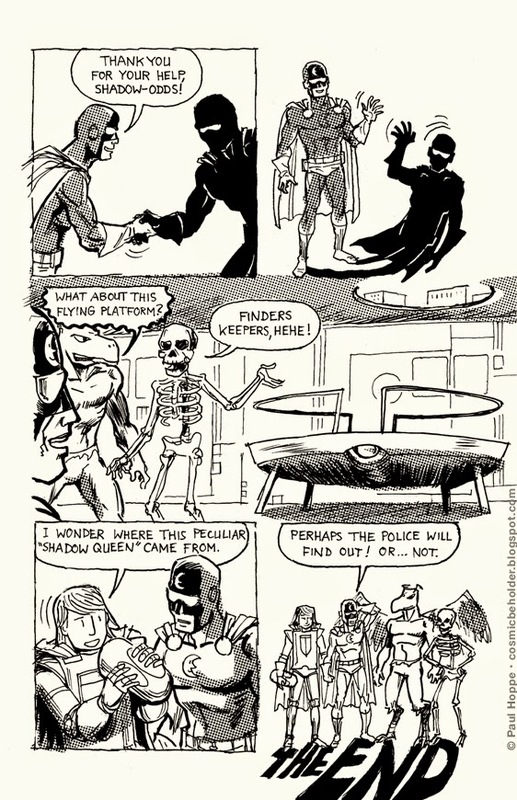 Read their escapades in TTB6, available like all my other issues from BirdCageBottom Books! 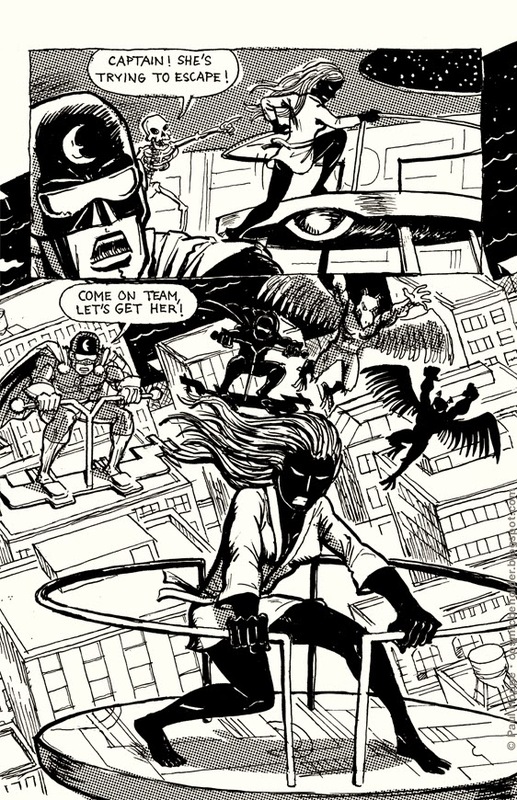 Once again, inspired by my favorite Avengers run ever, by Stern / Buscema / Palmer from the 1980s. 1960s, 1970s, 1980s, 1990s and 2000s. I’ve also done a rendition of the full team in front of Avengers Mansion.